What service do you use for deliveries? An item on my order was backordered. Do you partially ship? How do I know if my item has been shipped? Do you deliver to APO/FPO/DPO addresses? I live internationally and want the cheapest shipping possible. Can you ship via USPS First-Class Package International Service? Are the prices on the website shown in my local currency if I live internationally? I received a billing address error when checking out. Why do I see multiple charges on my account now? Do you offer companies terms? The item I bought is now on sale. Can I get the difference refunded? Can I visit and look at a product in person? Do you guys have any promos or coupon codes available? I recently placed an order that has not shipped. Can I add to my existing order? Part of my order is missing or incorrect. We use FedEx and the United States Postal Service (USPS) to send our orders. FedEx is used for Standard and Priority Overnight orders. Free Shipping orders will ship using the most economical shipping service. In most cases, this will be USPS First Class or Priority Mail service. KC Tool reserves the right to use discretion in any circumstance where it makes more sense to use an alternative delivery method. FedEx Priority Overnight arrives by 10:30AM the next business day when ordered before 12pm CT*. Click here for Saturday Delivery. 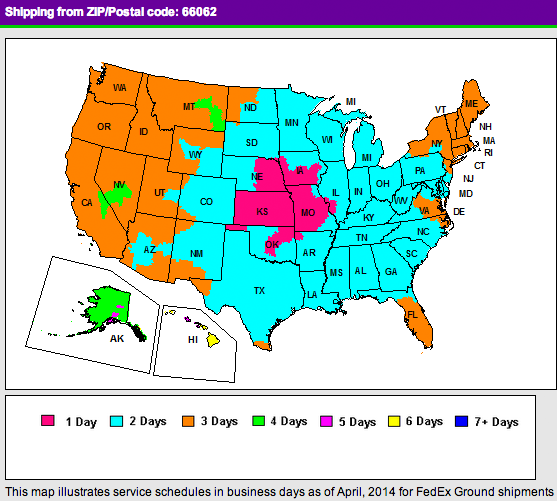 FedEx Standard Overnight arrives by 4:30PM the next business day when ordered before 12pm CT*. FedEx Ground is for shipments to commercial addresses. Most shipments will arrive within 3 business days. Click here for a transit time map. FedEx Home Delivery is for shipments to Residential Addresses. Home Delivery has the same transit time as Ground except they do not deliver on Monday. Click here for a transit time map. USPS First-Class Mail arrives within 2-5 business days. *next day delivery is not guaranteed during limited time sales, holiday seasons or when items on the order are out of stock. Overnight delivery time can also vary by location. **International delivery times vary widely, particularly if shipments are subject to customs and duty procedures beyond our control. When an expedited shipping service is paid for (i.e. USPS Priority, FedEx Standard/Priority Overnight), we will partially ship the order upon request regardless of the total order value. Replying to the backorder email sent from KC Tool Customer Service after the order has been placed. Contacting KC Tool Customer Service through Online Chat, by phone or email. Unfortunately, international orders are not eligible for partial shipments. Yes. You will be sent a shipping confirmation email as soon as your order has been processed. This email will also contain your tracking number. Please note tracking numbers are active and trackable up to 2 hours after the order has been collected from our warehouse, approximately 8pm Central Time, Monday to Friday. For orders marked shipped on a Friday afternoon, packages may not be trackable until they have been collected from us by USPS the following Monday. You will receive a shipping confirmation email once your order has been shipped. This email will also contain your tracking information. For orders placed online, we do provide the option to ship to an address different from the billing address. However, for security reasons, this service is discretionary. We reserve the right to verify details with our customers before shipping to a different address. If you have made a mistake with your delivery details, please contact us immediately and we will try to amend them. Yes, we can ship to APO/FPO/DPO addresses. Please ensure you complete the billing address field as appropriate and the APO/FPO/DPO address as the delivery address. Customers with a Kansas or Missouri address are more than welcome to choose the In-Store Pickup option as your shipping method. We are located at 1280 N Winchester St, Olathe, KS 66061. Our hours of operation are 8am-5pm Monday- Friday. We deliver to the United States (USA), Canada, Australia, United Kingdom (UK), New Zealand, Puerto Rico, the Virgin Islands and more. Please send any further inquiries to customerservice@kctoolco.com if you do not see your country listed during checkout. Each country has its own unique import procedures, which are subject to change. If you have an order held in customs then please contact our customer service team with your order number, via email. We will do our very best to help resolve the matter as swiftly as possible. While we recommend FedEx service for international orders, we can ship using USPS First-Class International service in certain cases. Know that USPS only guarantees door to door tracking within the United States. If tracking does not appear on the USPS website, please check your country’s local mail service website for possible updates using the tracking number provided in the shipping confirmation email. In most instances, yes. Please enter your FedEx, UPS or DHL account number in the order comment section during checkout. Any shipping charges paid during checkout will be removed and credited once the order ships. If additional information is needed, please contact us at customerservice@kctoolco.com. All prices shown on our website will be in US Dollars only. Yes, we gladly accept payments via PayPal. On the shopping cart page, choose "Checkout with PayPal." Credit card transactions are verified based on the billing address associated with the credit card using the Address Verification System (AVS). When the billing address entered during checkout does not match the address on file with the banking institution, an error is returned. These payments are declined by KC Tool and the order is cancelled. The authorization, however, will stay pending on customer's accounts for an average of 3-5 business days. Please note the AVS system is not used worldwide. If you are an international customer who receives an AVS Mismatch Error and you're sure the address was entered correctly, this is likely due to the banking institution not supporting the AVS system. Please try to use an alternate credit card or PayPal for payment. Yes, we can take Wire Transfers for more substantial orders. Please contact our sales team via email (sales@kctoolco.com) or phone at (913) 440-9766 to get started. Under current legislation, the only case in which we charge you sales tax is if your shipping address is in Kansas. In some cases, we are able to offer terms (Net 30) to companies/businesses. We kindly ask that orders meet a $300.00 minimum when seeking net terms. Please contact our sales team via email (sales@kctoolco.com) or phone at (913) 440-9766 for further information. Yes, we are licensed distributors for all of our products. They are 100% authentic. 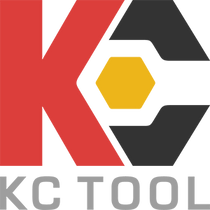 We do try to give you as much information as possible on all of our products, however, if you require any additional information then please email (customerservice@kctoolco.com), or call our customer service team at (913) 440-9766. They will try to provide you with all the information you require. As an online business our prices change in accordance with trends, customer demands and the manufacturers. We are, therefore, unable to refund the difference in price when an item you have purchased goes on sale, although we do appreciate how frustrating this can be. You can of course return the item for a full refund and then re-order the item at its markdown price, provided it is returned in accordance with our returns policy. We do our best to offer you great product at competitive prices, however, should a US online competitor be offering a like for like product at a cheaper price we will do our best to match it. You certainly may. Please note we do not have a display area, but bear with us and we can show you any of the items we have in stock in our warehouse. We are located at 1280 N Winchester St, Olathe, KS 66061. Our hours of operation are 8am-5pm Monday-Friday. First you need to register an account with us. This process is very simple and will ensure you can quickly and safely make orders. You can do so here. Once you have created your account you can browse the site; either by using the filters listed on the side, the categories listed in the "Shop" drop-down menu, or simply using the search field at the top. When you have finished shopping, simply go to your cart and choose if you will be checking out with a credit card or by PayPal. Then proceed to choose your shipping method and complete payment and the items will be shipped to you. Alternatively, you can contact a member of our customer service team at (913) 440-9766 to place a telephone order. We do offer promos and coupon codes occasionally. These can be found in our newsletters, website banners, social media (e.g., Instagram, Facebook, YouTube), or on our partner websites (e.g., Toolguy'd, Garage Journal, Tools in Action, Mechanical Hub, etc). * - Canada qualifies for free shipping on orders over $250. There may be separate customs and/or duties due prior to delivery. Check with your local province/territory for more details. If your order has been placed, but not shipped, we will make the change or cancellation straight away when possible. Please email customerservice@kctoolco.com or call us at (913) 440-9766 for assistance. Due to the way payments are handled, we are not able to add items to existing orders. We are able to combine multiple orders though so they ship in one package. To take advantage of combined shipping, please place a second order with the additional items as soon as possible. An order comment can be added to the second order requesting the combination. You can also contact us via online chat, email or phone to make the request. If a shipping charge was paid on any of the orders, but the new combined order qualifies for free shipping, we will refund any shipping charge(s). Multiple orders to the same address qualifying for free shipping may be combined automatically at our shipping department's discretion. Please note we can not guarantee changes are made prior to orders shipping but we will try our best to accommodate requests. Check the tracking link via your shipment confirmation email to view the most up to date information on the whereabouts of your package. Check for text messages, emails and attempted delivery cards from one of our couriers. Your package may be awaiting collection at a local office or you may need to re-arrange delivery. Check no one else residing at your address has taken receipt of your package. Check with the delivery service to see if they are holding the package or if there was a problem with delivery. If you still can't locate your package, please do not hesitate to contact our customer service team via email (customerservice@kctoolco.com) or phone at (913) 440-9766 with your order number on hand. We will work to find your package straight away. Should it not be found we will arrange a replacement or refund for you. From time to time mistakes do happen. However, we will do our best to rectify any errors made. If an item is missing from your order please contact our customer service team via email (customerservice@kctoolco.com) or phone at (913) 440-9766 with your order number and the name of the missing item. We will do our best to resolve the issue as quickly as we can. Click the "Log In / Register" link at the top right of our site. Click the "Continue" button under "Sign Up"
Click the " Your Account" link at the top right of our site.